Welcome to the Chevy engine light Question and Answer Page! This page should save you some time from submitting a duplicate question and having to wait for a response. We will include the model in most questions, so you can use the "Find on this page" function of your browser's "Edit" menu to get relevant info for whatever check engine light concerns you may have. 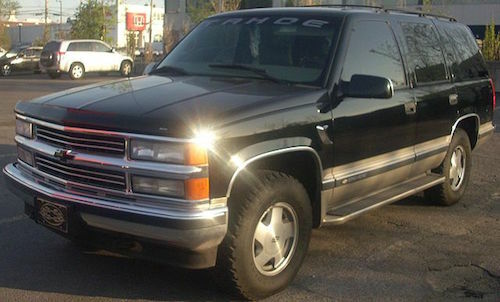 For instance, just type in "Tahoe" and search for responses relating to this vehicle. You could also type in a Chevy engine light code number by itself such as "P1345" to get all related responses for this trouble code. Just keep hitting "Find next" to go through all relevant check engine light responses. We don't recommend including a model year as this may make your search too narrow, and you may miss out on some relevant posts. Our Chevy engine light resources cover a very wide range of concerns, but if you can't find what you're looking for through these links or our code listings, then visit the check engine light "Get Help" link on the navigation bar. As always, all repairs should be attempted only by a qualified individual. Please read our Disclaimer before getting started. Thanks for stopping in, and we hope you have found something helpful from our site! I have a 1997 Chevy Tahoe. What could be throwing a P1345 code and what do I need to check for? Thanks for contacting us with your Chevy engine light question. Code P1345 dertermines if the distributor is installed incorrectly, or if a mechanical malfunction is present in the engine. The light will trigger when the engine is running and the camshaft sensor reference pulse is not detected at a correct relative position with the crankshaft pulse. Most likely causes for this Chevy check engine light code include a faulty crankshaft position sensor, a wiring concern or an improperly installed distributer. A quick check on the crankshaft sensor is to monitor the RPM value with a scan tool while revving up the engine. If the reading is close to twice the expected RPM, then the sensor is likely faulty. There are other less likley concerns possible, such as base engine or computer related issues, but these involve more in depth testing. I hope this information is useful. Thanks and have a great day. I have a 1998 Chevy S-10 Blazer. Please explain Chevy engine light codes P1115, U1041, U1064, P0118 in more detail. Thanks for submitting your Chevy engine light question. We do not currently address Body, Chassis or Network codes at this time as it would put the scope of our site beyond a manageable size so I won't be able to help with the U1041 or U1064. These codes will not likely cause the check engine light to illuminate. I can certainly help with the other Chevy check engine light codes P1115 and P0118. Trouble code P0118 - Engine Coolant Temperature (ECT) Sensor Circuit High Voltage, indicates that the VCM (computer) saw a voltage above 4.9 volts on the ECT circuit for longer than 5 seconds with the engine running. Code P1115 has the same meaning, but is defined as intermittent high voltage. Given these two Chevy engine light codes, I would say they are both caused by the same concern. The ECT sensor is a thermistor that varies resistance as temperature changes. As temperature increases, resistance decreases, so a low temperature will result in a high signal voltage (but never normally as high as 5 volts as this is full reference voltage). You will want to check connections at the VCM and the ECT connector and make sure they are clean and secure. Then test the wiring between the VCM and ECT for shorts or any other concerns. Refer to our article on Automotive Circuit Testing for help with this. The sensor is located on the left cylinder head between the 2 rear spark plugs and has a Black and a Yellow wire going to it, both of which also go to the VCM. If all the wiring tests out okay, monitor ECT reading with a scan tool and compare against actual engine temp to check for a skewed ECT sensor. Remember never to remove this sensor or open the cooling system while the engine is warm/hot, and observe all reasonable precautions. Hope this Chevy check engine light code response has been helpful! I have a 2001 chevy truck with an 8.1 litre gas engine. A couple of weeks ago I had a trouble code for the Oxygen Sensor Bank 1, then the engine light went off. It came back again so I checked codes and this time it reads P0342 - Camshaft Position Sensor A Bank 1 Low Input. What would you recommend checking? Also I'm no longer getting the oxygen sensor code. Thanks for your help. Thanks for submitting you Chevy engine light question! Code P0342 is set when the computer expects to see a high signal from the camshaft position sensor, but receives a low signal. This code is only set when engine speed is less than 4000 RPM, and the most likely symptom is long crank time when starting. The camshaft sensor is mounted on the lower left side of the engine. The connector has 3 wires at the sensor which are Pink/Black, Brown/Red and Red. The red wire should have battery voltage with ignition on and engine off. You should have battery voltage across the Red and Pink/Black wires. If so then these circuits are ok, and you will need to check the Brown/Red wire between the computer and sensor connector. Be sure to wiggle test wires and connectors for intermittents. Follow the wire testing procedures described in our Automotive Circuit Testing and Intermittent Diagnosis articles. If all wiring tests out okay, then the other possible causes are a faulty CMP sensor, computer or a trigger wheel concern. Much more likely to be a faulty sensor than a computer concern. Check for a cracked or damaged sensor. If you have a capable scan tool you can monitor the CMP sensor and check for erratic signal concerns. You can remove the sensor for inspection, and check for debris between the sensor and trigger wheel or excessive metal build up on the magnetic pick up. I hope this information is helpful! Thanks, and let me know if you need any further assistance with this (or any other), chevy engine light concern.